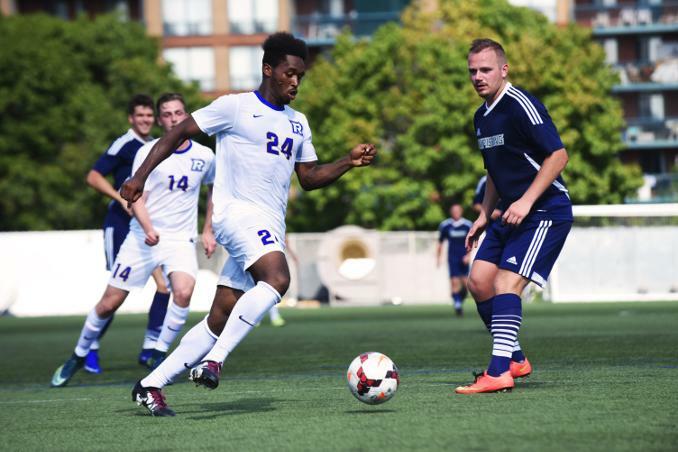 The Ryerson Rams men’s soccer team was too much for the visiting Nipissing Lakers as they beat them 4-0 on Sunday afternoon at Monarch Park. The Rams came out strong, applying heavy pressure, and it only took five minutes for Raheem Rose to find the back of the net for Ryerson. Five minutes after scoring their first goal, fifth-year senior Luka Lee chipped the ball past the Nipissing keeper to put the Rams up by two. Nick Lambis added a third goal for Ryerson before the end of the first half, and halftime didn’t help the Lakers. The second half saw much of the same possession dominance from the Ryerson squad and in the 53rd minute Rose put the game out of reach, scoring his second of the game. The Rams were able to take down the Lakers with relative ease in just their second game of the season, but the team is focused on the bigger picture. After claiming first in the OUA East division regular season standings in each of the past three seasons, the Rams are focused on getting into the OUA final four and ultimately making it into this year’s CIS championship in Guelph. “Last year we won the conference, the year before we make it to the Final Four and didn’t quite make nationals. Finishing the top of the table isn’t our goal,” said head coach Filip Prostran. The Rams will be back on the pitch on Saturday, Sept. 3 against UOIT. With their win against Nipissing, the Rams remain undefeated with a record of 2-0-0.